Lodging houses are quite cheap in Coron. We stayed at Rudy’s Place Lodge (read more about it here), about 0.8kms from the town proper. The rate was Php600/night for fanned rooms that are good for 2 persons and Php900 for A/C rooms. Basically, what they do is they will just provide you a standard room with both fans and A/C. Once you make that air-conditioner run, they’ll charge you Php900. Because we promised to be frugal, we kept in mind to use only the fan during our stay. Here’s my pros and cons list regarding Rudy’s Place. Note: This is a purely personal declaration of my experiences in Rudy’s Place; I wasn’t offered any payment for positive reviews. Room is actually huge for 2 people! They have a queen size bed plus a single bed where you can place your things. You have 3 bath towels you can use (if you’re not grossed out with using hotel towels), so you may remove the towels on your to-bring list to make your bag lighter. Private bath is suuuuuper small. And once you take a bath, the water splashes across the whole room because of the hole on the bathroom door. They don’t give students’ discount. Sad. Food they offer is waaay too expensive. Php100/head for breakfast and Php200/head for lunch and dinner. Other lodges that fall under the Php600/night budget were KokosNuss and Krystal Lodge (read a review about Krystal Lodge here). If you aren’t on a tight budget and you can splurge on good rooms to stay in while exploring Coron, you may opt to rent air-conditioned rooms under newly developed hotels at the heart of the town, like Coron Gateway Hotel. great analysis! 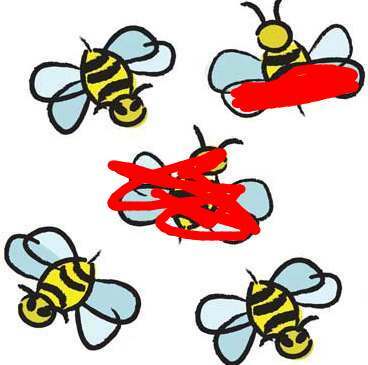 I give your post 5 bumblebees!